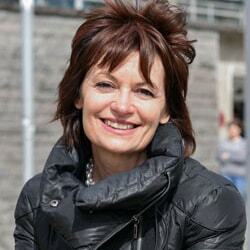 As a science communication fellow at IIASA, I had the opportunity to talk to Dame Anne Glover, who was recently made an IIASA distinguished visiting fellow. Originally a successful researcher in microbiology, she previously served as the first chief scientific adviser for Scotland, as well as the first chief scientific adviser to the president of the European Commission, and is now president of the Royal Society of Edinburgh. In your roles as scientific adviser you had to know about a broad range of relevant scientific topics. How do you keep informed about topics that lie outside your own area of research? Of course no-one can be an expert in all the different areas of science. As a microbiologist, I am very specialized, but I am also a generalist when it comes to other areas of research. I keep up to date by reading articles about lots of different topics, from climate change to chemical toxicity or Alzheimer’s research, just because I am curious and interested. However, if a minister or policymaker asked me to brief them on a particular topic, I would consult organizations with expertise in that area and ask them questions until I felt that I understood the topic. Then I would translate that scientific, often jargon-filled research into something that makes sense to a non-specialist. Part of the role as scientific adviser is not so much being an expert as being a translator. Do you follow any science publications aimed at a broad audience? What are your favorites? There is an organization called Sense about Science that publishes reports on issues that are being discussed among the public. They also have a fabulous service called Ask for evidence. Anyone can go onto their website and type a question, for example “Do female contraceptive pills end up feminizing fish in water streams?”, and they have a panel of experts that can comment on that, give you the evidence, and explain why this issue might or might not be a problem. It’s fantastic! I often use these answers as a starting point to find out about something. I follow several other popular news outlets as well, for example New Scientist or the science and nature section of the BBC news app. I don’t expect absolute accuracy from those, I just expect to get a first impression of a research area. I also use Twitter as a source of information, because people often tweet about interesting science articles. You are very active on Twitter. Has social media been useful to you, and how can it be used effectively? I came to Twitter kicking and screaming when I joined the European Commission as chief scientific adviser to the president. I just thought that I had way too much to do to spend time on social media. It was Jan Marco Müller, a former colleague and now head of the directorate office at IIASA, who convinced me that Twitter could actually be a good way to tell people what I was doing, especially since transparency about my work is very important to me. Have I found it useful? Enormously so! When I was at the commission I used it to see what really got people excited, either in a good way or in a bad way. When people were against a new technology, it helped me to understand their reasons. Tweeting is also an opportunity for me to help other people by highlighting interesting and useful events or initiatives. It can even be a little bit addictive. How can science communicators and journalists reach a wide audience without oversimplifying scientific content? The biggest nervousness I see among scientists is that of oversimplification. That is because, if you do oversimplify, you’re not going to upset your lay audience, but you will upset your scientific audience. I struggled with this for quite some time myself. Generally speaking, I would always favor simplification, of course not to the point of saying something that’s not true. I would however encourage scientists to be less afraid of simplification when speaking to a non-scientific audience. You will never be able to please everyone, you can only do your best to make an abstract subject accessible and interesting to people. Do you have any tips for young scientists to make their work visible to the public? In many cities there are science centers, museums, and other places where people get together, and there is nothing, other than their own modesty, to stop a young scientist from offering to talk about their work there. If it seems too daunting to do that kind of thing on your own, you could maybe do it with some of your colleagues. There are lots of opportunities out there for young scientists. Nobody is going to give those opportunities to you, but nobody is going to stop you either! You just have to take them! If you do take them, think about what audience you are trying to reach beforehand, for example, if you want to talk to children or young adults. Then just be creative in how you present your research–try to build a story. Two good things will come out of it: one is that even if only 50 people show up, and only five of them are interested in what you are saying, you will have transformed the lives of those five people and made them excited about something. That is an achievement. The second thing is, that if you are doing things like that, and the young scientist next to you isn’t, it makes you different, and you have added value. You will also gain experience in communicating, which in turn will make the impact of your science much greater in the future. Everybody wins really, and it can be good fun as well.